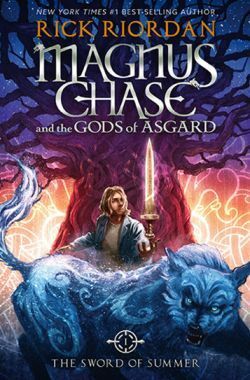 The fourth of Rick Riordan's Urban Fantasy series, focused on Norse mythology and Magnus Chase, first cousin of Annabeth Chase (daughter of Athena). Two years ago as the wolves were breaking into their house, Magnus' mother told him to run. Since then he's been hiding as a homeless boy on Boston's streets while avoiding police and truant officers. Now, however, his uncle Randolph, who his mother always told him to avoid, is looking for him whilst bumbling something about incoming Ragnarok, wolves and Magnus being a child of god. Despite Magnus wishing nothing more than to escape all the incoming insanity he's pulled into the world of Aesir, Vanir and giants and is forced to take up arms and fight. Oh, and die. Dying is somehow obligatory. Absurdly Sharp Blade: Sumarbrandr is the sharpest blade in all the nine worlds, capable of cutting even through Gleipnir. Hearthstone's parents were emotionally abusive towards him, saying the wrong brother died. And that's putting it mildly. They forced him to literally pay them back for "killing" his brother, by skinning the monster that killed him and forcing him to cover the entire hide in gold by performing chores. Then they charged him gold for making mistakes, taking an hour of free time, and eating a meal. Starting from when he was eight. Magnus: Hearth, I thought your parents beat you or something. This is worse. Loki's pretty bad, too using his daughters and literally controlling them, putting Samirah to sleep at the beginning, and willing Alex and Sam to die during the climax of the second book. Besides Loki, Alex's mortal parent (by which we mean her father) is nothing to show off, either. One the last memories Alex has of him is his kicking her through a set of stairs, all the while breaking her pottery vase because he thought that both of them aren't normal. Mallory's father is implied to be this as well, judging by comments about his alcoholism. Magnus: WHAT WAS it about dads? Almost everyone I knew had a garbage father, like they were all competing for the Worst Dad of the Universe award. Affably Evil: Loki is friendly and kind to Magnus, offering him advice and comfort where other gods don't do a thing and caring about fate of his daughter. He's also the series' Big Bad. Surprised? Agent Peacock: Blitzen is always dressed most fashionably and points out where his companions' attire isn't all that fitting. A Good Name for a Rock Band: Mr. J and Bag Lady Ran. Alcohol-Induced Idiocy: Geirrod is so drunk he doesn't notice that his throwing coals after Magnus and the others is damaging the pillars, which eventually causes the ceiling to collapse on him. All Trolls Are Different: X is a half-troll, but he looks like he's made of rock, is "bigger than several independent countries" and quite simple, though by no means stupid. He's also a god. An extremely powerful god, in fact. Not Loki, but Sigyn. She catches the venom from the serpent to stop it from dripping into Loki's face. Her own sons were slaughtered to make the bindings. The very person she tries not to hurt (but still gets hurt anyway when she has to throw the venom away) still treats her with disdain and regularly cheats with her (And can even project himself outside). She hasn't spoken in a thousand years. What's extra worse, she wasn't told to do this - she chose to because she loves her husband. No wonder she tears blood. Loki finally gets his comeuppance with this fate at the end of the series. He's chained, check. Venom drips on his face, check. He's bound even more that he might can't project himself, check. Sigyn is given a chance to leave him, check. All he's gotta do is to wait for Ragnarok, where he'll meet his end. Animorphism: Samirah and Alex, as daughters of Loki, can change into animals. Appropriated Appellation: Alex does this in a way with the intertwined-snakes symbol she has as a tattoo and signs her pottery with. She likes it because it was originally a symbol for change/adaptability, reflecting her own fluidity, and she wants to use it for good and ignore the associations with Loki. Archnemesis Dad: Loki, for Samirah. He's also this for Alex, despite being her mom. Sam's grandparents set up an engagement with a family friend. However, she has feelings for her fiancé and points out that their families didn't set up a marriage without including them in the decision. Loki arranges for Sam to marry the giant Thrym, supposedly to help Thor regain Mjölnir. Sam refuses to even pretend to do it so Alex takes her place. Your dwarf's pith helmet is stupid. You could not save your mother. Artistic License  Biology: Magnus repeats the long discredited statement that wolf pack hierarchies are determined by how far other wolves are willing to push against their place in the pecking order (it's a metaphor for another character's behavior). In reality, they're simply nuclear families (the Alphas are literally the parents of the rest of a pack). It's at least excusable since he heard this from Halfborn Gunderson, who lived and died long before the above became common knowledge. Ascended Extra: T.J., Mallory, and Halfborn have very little to do outside Asgard in the first two books, but they have a greatly expanded role in the third book due to accompanying Magnus during his Niflheim quest. Attending Your Own Funeral: Annabeth thinks Magnus is doing this, but he actually is dead so it's more of a subverted or zigzagged example. Subverted - Frey says that he'd understand it would look like this, but Magnus breaks the spell by hugging him, as he's not going to miss the chance. Played straight with Mallory and Frigg. The latter wants to make up for all the years spent without visiting her once by offering a pep talk. Mallory being Mallory, she brushes it off. The Baby of the Bunch: In his travelling company, Magnus is the youngest by at least a year. The Bad Guy Wins: The second book has Loki manage to use a massive Batman Gambit to escape his imprisonment. Fenrir had Magnus' mother killed deliberately so that the kid would toughen up enough to be able to find Sumarbrandr, the blade necessary to cut Wolf's bonds. With regards to the above, Odin can play this game too. The second book is basically one big Batman Gambit for Loki, to the point where even after the characters figure out his plan they still have no choice but to walk right into it. The only person he can't manipulate only manages to kill off some of his pawns and he still goes free. The third has a big one: as Sam states, Frigg basically set up Floor 19 team by having Mallory assigned there. Without her, Halfborn and T.J. won't befriend each other, and Odin won't try to assign Sam, Magnus, and Alex there. The entire journey won't happen and Loki would stand unopposed. Taylor Swift is at least part dwarf, as Blitz corrects Magnus when he's surprised that dwarves like human music. John Henry was a son of Thór. Berserk Button: Fenrir is mightily pissed by anything to do with Tyr, who was crucial in binding him the first time around. Big Bad: Loki. Fitting, since he's meant to lead the giants and other enemies into battle against the Aesir, Vanir and their followers at Ragnarok. The Einherjar kill each other on a daily basis just for the fun of it. Halfborn Gunderson in particular is a berserker and will revel in the slaughter until he is hacked to pieces. Sumarbrandr, being a living sword, naturally qualifies. Extensively. Bride and Switch: The story of Thrymr and Thor-in-a-wedding dress comes up, since Thrymr III has the hammer and gets engaged to Sam. Alex winds up switching places with Sam, which is fortunate because Thrymr III learned from his grandfather's mistakes and magically checked the heritage of his bride-to-be to ensure he's marrying Loki's daughter. Book-Ends: The Ship of the Dead begins and ends with Magnus and Alex sitting on the roof of Randolph's mansion together. The only difference is that at the end they're holding hands. Bunny-Ears Lawyer: A lot of the Norse gods are... not exactly how most people envision them. Thor is more interested in catching up on his television series than anything else. Odin talks more like a motivational speaker than the ruler of all gods. On a non-deity end of spectrum, Sumarbrandr is an excellent enchanted sword, but calls Magnus señor and tells everyone that his name is now Jack. Came Back Strong: As an Einherjar, Magnus is stronger and hardier than a regular human, although he was already tough thanks to his godly heritage. Chekhov's Gun: Blitzen's bulletproof menswear. It saves him from having his jugular ripped out by Fenris and is later endorsed by Odin. The disarming spell Magnus accidentally uses during his "mock" fight in Valhalla comes back in the finale. The vatnavaettir and how Sam manages to tackle them down. As it turns out, she earns their allegiance, as well, which comes in handy when Floor 19 team are cornered in Naglfar. Clarke's Third Law: Odin hung himself for nine days to learn the magic of runes... and stood in line in a blizzard for six days to learn the magic of smartphones. Clever Crows: As befits the story where Odin's one of the players. Crows are following the characters several times. Comically Missing the Point: Sif seems to get this when she views being called a "trophy wife" by her husband Thor as a compliment, since she thinks he's referring to her habit of fashioning trophies from her gold hair . Compelling Voice: Fenrir's voice makes him seem Affably Evil and compels people into being more likely to do what he wants. He has it after his father, Loki. Contrasting Sequel Main Character: Magnus Chase to Percy Jackson, Jason Grace, and the Kane siblings: He's grouchy, rude, not the son/host of a famous god from his Pantheon a la Poseidon or Horus and not described as attractive or nearly as likable (in universe). Cooking Duel: To obtain a new rope for Fenrir, Blitz must take part in a craftsmanship duel against his father's bitter enemy. To make things serious, the losing party loses their head. Covered with Scars: Loki's face is terrifyingly scarred, "thanks" to a snake which spits on his face perpetually as part of gods' punishment. Magnus's cousin Annabeth Chase (by her father Frederick and Magnus's mother Natalie), who originally appeared in the Percy Jackson and the Olympians series, appears on three occasions in The Sword of Summer. The Hammer of Thor has multiple nods towards the Percy Jackson and the Olympians series, with Magnus reflecting on the existence of multiple pantheons on several occasions. Annabeth show up at the very end and plans are made for Magnus to meet Percy to get some pointers on their upcoming sailing trip to Scandinavia through hostile waters, implying more crossovers in the third book. And there really are more crossovers in The Ship of the Dead, as Percy and Annabeth appear in the prologue and epilogue chapters. In the last bit, there seems to be some trouble in California, foreshadowing the third book of The Trials of Apollo. When Magnus is on the phone with Annabeth at the end, he notices that she sound's like she's been crying. When asked about it, she tells him that she just got some bad news, which turns out to be Jason's death from fighting Caligula. What with the Valhalla scenes of literal blood-baths, Magnus Potty Mouth, and other pleasant things, this book is much more grim than the other books in the Shared Universe. This may be because compared to other mythologies, Norse is very dark. Entirely apart from gore and cursing, it deals more directly and maturely with issues that were handwaved or simply not addressed in the past books, such as the interplay between the gods and monotheistic religions and the illegitimacy of demigods, and a lot of parental abuse issues are featured. Other issue dealt also includes explicitly featuring a genderfluid character (namely, Alex from the second book onward), making the series possibly the first children's book series to feature such a character. Dead to Begin With: First act of the story ends with Magnus dying and Samirah taking him to Valhalla. Death Is a Slap on the Wrist: In Hotel Valhalla, everyone dies all the time and enjoys it, because einherjar can't die permanently as long as Odin doesn't want it. Deceased Parents Are the Best: Natalie, Magnus's mom, is only ever spoken of in a positive way. Likewise, Sam's mother, Ayesha, though she's not old enough to remember her. Disability Immunity: Hearth isn't affected by Ratatosk and Fenris' verbal attacks due to his deafness. Magnus' father is missing, although Magnus oddly never feels it very badly. He shows up in a vision near the end. Though Magnus' situation definitely pales in comparison to his teammates. Blitz's father died building the prison for Fenris Wolf, Hearth's is abusive, Alex's reject her, while Sam has Loki as a father. Disproportionate Retribution: Loki believes his imprisonment and torture to be this. He points out that for Aesir, Death Is a Slap on the Wrist and despite all the outrage over his death, Balder has a fairly pleasant afterlife in Helheim (or so he claims). When Magnus sees Loki's prison in person, even he thinks that, despite Loki's crimes, it's kind of overkill. Double Standard: Alex sometimes faces this in The Hammer of Thor due to being trans and gender fluid, both as Truth in Television for the modern world and because the ancient Norse sometimes stereotyped AMAB non-cis people as "sneaky" and "untrustworthy." At one point Thor complains that Alex's plan to switch places with Sam for a wedding won't work because Alex is "not even a proper girl" because she's an argr (trans/genderfluid). Subverted with Halfborn, who is the first to refer to Alex as an "argr" but later it becomes clear that this is his way of being respectful of her gender. The Skofnung Sword can't be drawn in the presence of a woman. Turned into a Chekhov's Gun in the climax, when the giants can't draw it no matter how many times they try, because Thrynga is a woman. Dreadful Musician: Jack is rather fond of singing top-forty hits, but he isn't very skilled. Magnus thinks having a sentient sword with a passion for terrible singing is a much more effective threat than an ordinary sentient sword. Early-Bird Cameo: John Henry is mentioned here in passing before having a much larger role in the Rick Riordan Presents book 'Tristan Strong Punches a Hole in the Sky'. Earn Your Happy Ending: The journey to stop Loki pretty much changes everyone in the Big Banana. Not only is Loki imprisoned and Ragnarok averted (for now), but the gods personally acknowledge the heroes for their bravery or claim them if they haven't already (like Frigg with Mallory and Tyr with T.J.). Halfborn regains his pride in his hometown and manages to mend his relationship with Mallory after fighting together for their lives, probably for good; Hearth, despite having to face what remains of his father, is now free from his past and ready to move on with Blitz; and Magnus and Alex realize that there may be more than just friendship between them. They decide to test it out by opening and running a homeless shelter together, a full circle adventure for Magnus. Oh, and it's the end of Ramadan and Sam can now drink, eat, and swear all she wants! Then again, she already has enough life-changing experiences in the previous books. Eldritch Location: Geirrod's house. One room has his daughters, who are 50 feet tall. When Magnus and his companions run under the door into the next room, they find it's smaller, with a 25 foot ceiling, even though it should be too small for the giants from the last room. Also the door is too small from this side for the giantesses to have walked through, and they can't even go back under the door. Magnus wonders if giants change size as they walk between rooms. Embarrassing Middle Name: Mallory Audrey Keen. Actually, not because the middle name, but because the initials spell Mack. The End of the World as We Know It: Starting Ragnarok, which would eventually result in this, seems to be the aim of the villains of the series, and even the good guys are preparing for it. Empathic Weapon: Sumarbrandr, AKA "Jack", formerly owned by Frey and now by Magnus. It's also fully sapient. Endless Daytime: The Elven Realm, Alfheim. The sun sets only to immediately rise again on the other side. Evil Uncle: Natalie Chase had always told her son never to approach uncle Randolph, and his involvement at the start of the story ends with Magnus dead. Even moreso in the epilogue, when it turns out he's working for Loki. Excalibur in the Rust: Sumarbrandr was found encrusted in barnacles at the bottom of an icy river. It turns out to be an extremely powerful weapon, as well as a good companion. Faeries Don't Believe in Humans, Either: In modern times Alfheim and Nidavellir (worlds inhabited by elves and dwarfs respectively), the magic has gone away and humans are seen as mythical creatures confined to fairy tales and TV shows. Famous Ancestor: One of Samirah's ancestors is Ahmad ibn Fadlan, an Arab traveler who wrote a lot about Nordic culture of his time. During the camp-out in Jotunheim, as well as in Valhalla. In the second book, Magnus and Alex share a touching moment while waiting for Blitzen and Jack to finish a bowling bag. First Episode Resurrection: Subverted. While Magnus does die very early on in the book and comes back, it's as an Einherjar. So, though he technically did come back, his status is actually one of the potential forms the Norse afterlife can take. He even visits his dead body to confirm that he is, in fact, dead. It's about as creepy as you'd expect it to be. The Big Guy: Sumarbrandr does the most "heavy lifting"
The Sixth Ranger: Alex, who joins up in the second book. Flaming Sword: Surt creates a sword out of fire. Flat-Earth Atheist: Samirah refuses to believe that the Norse gods are divine, as she's a devout Muslim for whom there is only one God. Magnus, on the other hand, is an atheist. Samirah says that it sounds like the beginning of a bad joke: "An atheist and a Muslim walk into a pagan afterlife..."
Gender Bender: Alex, introduced in the second book, is gender-fluid and transgender. Her gender identity is most often female, though not always. Although Alex would be able to shapeshift his/her body to match his/her current identity, she doesn't do so, accepting her identity as-is. Gender-Blender Name: Alex, of course, since it's easier to have a name that works for both of her gender identities. One of the main characters is a Muslim girl living a double life in service to a pantheon of pagan gods, being the child of a god herself...ballsy indeed. On a more minor note, Riordan does use damn more often, the word 'crappy' shows up and he even slips in jackass at one point. It's shortly mentioned that Loki is the mother of Sleipnir. Magnus chooses not to research the details. A wise choice. The way Freya pays the dwarves for her jewelry. God Was My Copilot: Did you really think that Odin wasn't going to pull his signature disguise routine? Gosh Dang It to Heck! : Averted for the first time. Mild cursing is used outright three times here (and referenced with "Helheim" in place of the usual). Before, the cursing was only represented by "I cursed" statements or Toilet Humor. Guns Are Worthless: At least in Valhalla, they are not considered all that effective in the various combats to the death. Half-Human Hybrid: Magnus himself is son of Frey, one of the Vanir. His ally Samirah "Sam" Al-Abbas is a daughter of Loki, and the well-meaning but somewhat antagonistic Gunilla is a daughter of Thor. Other demigods also appear in more minor roles, including as residents of Valhalla. In the second book we get Alex, a daughter/son (depending on how she/he identifies at the time) of Loki. Have You Seen My God? : Odin's been missing for two years by the time the story starts. This is because he was hiding in Valhalla as X the half-troll. Healing Hands: Magnus discovers that he can use his father's magic to heal. Hereditary Hairstyle: Underplayed, but when meeting Frey, Magnus notes that he has the same hairlock his son does. Heroic Resolve: Magnus finds his in the fight with Surt, after Gunilla is killed. Holy Hand Grenade: While Magnus' powers revolve more about creation, healing and the like, he can also use a boost which disarms everyone around him. I Have Your Wife: The epilogue reveals that Loki is forcing Randolph to work for him because he's holding Randolph's wife and daughters hostage. Of course, this being Loki, it's best to take his claims with a grain of salt. Improbable Weapon User: Alex's signature weapon is a potter's cutting wire-turned-garrote. Sif gives Alex a new one made out of her golden hair. Sam thinks Magnus is asking about falafel either to needle her about her engagement to Amir, whose family owns a falafel shop, or as going with Muslim stereotypes. But no. He just really loves falafel. Also reversed when they're choosing bait for their fishing trip. Sam: Go big or go home? Magnus: She said to the homeless kid. Inspector Javert: Gunilla chases the heroes throughout the first book, as she's convinced that they're actually traitors to Valhalla and doesn't believe their explanations. It Makes Sense in Context: The chapter names return in this series, with such gems like Good Morning! You're Going To Die!, Come To The Dark Side, We Have Pop-Tarts, Let The Crafting Of Decorative Metal Waterfowl Begin, and I Got The Horse Right Here, His Name Is Stanley. Jedi Truth: Negotiations with Frost Giants are filled with this. Jerkass Gods: This time, actually averted. Loki is affable, Thor is misguided, but well-meaning, Odin is supportive, if trickstery and Frey is genuinely warm and friendly. Sif apparently has Hidden Depths if Alex's change in attitude are any indication (though Magnus and the reader never find out what, since he spends little time with her). Even when Thor is being insensitive (see Double Standard above) he doesn't get angry at Alex for calling him out on it, he just meekly backs down. Killed Off for Real: Gunilla, as a result of the final battle. Kraken and Leviathan: The former gets name-checked as the heroes make their way to their final battle in the first book, but doesn't make a formal appearance. Laser-Guided Karma: Loki treated Sigyn like crap. Even she abandons him at the end. Like Parent, Like Spouse: About halfway through the second book, Magnus realizes that Alex, whom he begins to harbor a crush on, reminds him of his mother. He decides not to dwell on the psychology of it. Magical Girl Warrior: Samirah's work as a Valkyrie has shades of deconstruction of this one. She leads a double life, is terrified of imagining what would happen had her grandparents found out and at one point is grounded "until the end of days" for what they think is spending an evening in friends (she almost died four times during this time). Magic Staff: Hearth gets one to facilitate his upgrade into a badass wizard. Man Hug: Magnus gives hugs to both Blitzen and his father. Misplaced Wildlife: A running gag (true to the source material) of various magical animals like deer living in trees. Missing Mom: Magnus, Sam, and Hearth all have dead mothers. One of the chapters of The Sword of Summer is entitled 'Hearthstone Passes Out Even More than Jason Grace (Though I Have No Idea Who That Is)'. When Magnus asks his sword to use a glamour to be less noticeable he suggests a pen. He imagines the sword saying it's a stupid idea. This gets brought back in the third book, when Jack develops a crush on Riptide, and has a brief arguement with Magnus over who thought that was a bad idea. Mundane Afterlife: Although Magnus likes Valhalla, he thinks it would be boring to spend the thousands of years until Ragnarok there. Mundane Utility: Thor uses his hammer, when he hasn't lost it, to stream television shows. His staff works too, but it doesn't get as many bars. Named Weapons: Aside from legendary weapons like Sumarbrandr and Mjölnir, the Dwarves have a field day with this one. Their craftsman culture is so strong that everything has to be uniquely made and introduced by its name and history, right down to bottles and furniture. Junior even has a named walker: Granny Shuffler. Nay-Theist: Magnus is a self-described atheist. Nice Job Fixing It, Villain! : Loki's words about small choices being able to affect the bigger picture and fight the fate give Magnus Heroic Willpower even when the god would probably much rather they didn't. The Night That Never Ends: Nidavellir is always night and illumination is provided by glow moss. This is because sunlight is fatal to dwarves. No Man of Woman Born: How Loki's chains are cut. The chains are so strong even the sharpest sword in the world dulls after breaking just one bond? Then use a super-sharp sword that can be re-sharpened every time it's dulled. The Not-Love Interest: Magnus and Sam. Since the first book, they're set up as the typical main cisgender pairing like in other Riordan novels, but problem is, Sam is happily engaged to someone else and Magnus doesn't feel the need to ruin it. Enter Alex in the second book. She is developed into Magnus' actual love interest. Sam and Magnus instead become Like Brother and Sister. Problem solved. Off with His Head! : In traditional dwarven duel, the punishment for failure is beheading. Subverted, as Blitz prefer to exchange it for one other favour. Official Couple: Sam and Amir are this from the start, due to their engagement. Mallory and Halfborn are one since the second book. Magnus and Alex might be in the end of the series, though there's currently not enough sparks to go on. Oh, Crap! : The reaction of Alfheim police officers Sunspot and Wildflower upon being told that the kid they'd been happily antagonizing and insulting is a son of Frey, their world's patron god. One Mario Limit: Averted, in the acknowledgements Riordan thanks Cassandra Clare for letting him use the name "Magnus". Our Elves Are Better: So completely averted that Magnus lampshades it multiple time. For instance, they are mortal, they haven't done magic in centuries, and they're explained to be every bit as prejudiced and intolerant as humans; in fact they may be more so since Blitzen states they want things absolutely perfect. Hearthstone, being born deaf, did not qualify as "perfect" to his parents, and started to hate him even more when his brother, Andiron, died. They even were of the opinion that Hearth should have died instead of Andiron. Our Dwarves Are All the Same: This is ZigZagged more than averted. Some dwarves can pass as handsome humans, and some who Magnus classifies as dwarves are really Dark Elves, though this is considered a misnomer for everyone but dark elves. Our Giants Are Bigger: The giants from the Percy Jackson books are usually only about 12 feet tall. The tallest designed to fight gods max out around forty to fifty feet. Typhoon, the largest and most powerful giant in Greek mythology, is describe as around the size of a skyscraper. The average Giants in Jotunheim can easily get up to 2,000 feet or taller(and given a lot of giants have magic and shape-shifting probably much, much bigger) which is why a god with the universe's most powerful weapon is needed to keep them at bay. The largest, Ymir, was used to create the Earth. Out-Gambitted: Fenrir's Batman Gambit is trumped by Odin's careful planning. Pet the Dog: While Thor comes across as kind of a jerk (although it's mostly a slight Values Dissonance), after Jotunheim's trip he's most helpful and aids the heroes both in getting wherever they need to be and, in Hearth's case, taking a level in badass. He even admits to still liking Loki, despite all he's done. Post-Modern Magik: Everything from streaming TV on a hammer to reality-crossing motorboats. The titular Sword of Summer, Sumarbrandr, also does this. It can fight on its own and accomplish incredible feats simply by its wielder telling it what he wants it to do and letting go. But the instant the sword is taken back up in the wielder's hand, the wielder suffers the fatigue and strain of the actions performed with consequences that can be potentially lethal, depending on what the sword was asked to do. Power-Strain Blackout: Happens to Magnus with his healing powers and Hearth after using runes. This also occurs when Sumarbrandr returns to Magnus's control after acting on his own. Pre-Asskicking One-Liner: Magnus gets one during the fight with Fenris. Prophecy Twist: At the end, Odin deconstructs the Norns' prophecy that had been used to paint Magnus in a bad light. Red Oni, Blue Oni: Thor's two goats, Otis and Marvin. Otis is nigh-suicidal and The Eeyore, while Marvin seems to have the entire universe as his Berserk Button. Thor's chariot is pulled by two goats, who revive a certain amount of time after being killed. There are many more, including the Saehrimnir who is killed everyday to feed the Einherjar, who are themselves this. This is actually sort of a Norse Mythology hat. After Ragnarok, the world will be destroyed and yet brought back forever, along with a few Gods. Rule of Symbolism: Alex has heterochromianote Mismatched eye colors, or as Natalie Chase would have called it, "David Bowie eyes", which seems emblematic of her being genderfluid — sometimes male and sometimes female. Also, out of all pottery designs, she likes two-faced ones the most. Sarcasm Failure: Magnus' reaction to meeting Hel. She mocks him with the possibilities. "No jokes, Magnus Chase? Who the Hel are you? What the Hel do you want? You look Hela bad. I was expecting more bravado." Savage Wolves: Magnus' mother was killed by them, and Magnus hears their howling several times in Jotunheim. Sea Monster: When trying to catch Ran's attention, Magnus and Samirah intentionally fish out Jormungandr itself. Ran even suggest they free him and kickstart the Ragnarok. Self-Imposed Challenge: In the third book, Samirah, throughout the entire, dangerous monster-infested with 99.9% chance-of-being-killed, journey to Niflheim, fasts due to her Ramadan duties. She doesn't really have to do it (you can postpone it later if you can't manage, as Amir states), but she insists. Magnus talks about this crazy task during his flyting duel with Loki. Some jotnar apparently understand and applaud it. Shameful Shrinking: A flyting inflicts this quite literally on the losing side. As Magnus gets verbally lashed by Loki, he finds himself shrinking until he has to crane his neck to look up at Loki, with the trickster likely planning to step on him when he's mere inches in height. But then Magnus almost literally builds himself back up by pointing out that he has the Power of Friendship and Loki doesn't have anyone, not even his wife, truly on his side. This reduces Loki down to less than two feet in stature and he has no comeback against it. Shout-Out: Several, ranging from Doctor Who to Taylor Swift. Of special note, however, is the Undercover Boss stunt Odin pulls at the end of the book. Not only is it completely unexpected, but it's also in line with what he would do from the source material. In Hammer of Thor, Blitzen chooses "Password" as the magical password to activate an enchantment that changes the size of a bowling bag. Frey assures Magnus that his mother would be proud of him towards the end of The Sword of Summer. The "affirmations portion" of the slideshow is this for all of our heroes. Magnus briefly has an Imagine Spot of Aegir petting his beloved mead cask and saying that his mead cask is angry, and when his mead cask is angry, people die, much like in Austin Powers. A rather groan-worthy one (once you pick up on it) in The Hammer of Thor: in his hall of Bilskirnir, a choir sings out every time someone mentions the building's name. Bilskirnir means "bright-crack," a kenning for lightning, which Thor is the god of. And what is another word for lightning? Flash. Ahhh-ahhh! As per Riordan tradition, the Norse myths the series is based on are very well researched. Customs such as the practice of Thing is described, and it was a kind of proto-democracy; the Vikings weren't really barbarians if they managed to land as far as North America, after all. And the Skofnung's Double Standard restriction? Based on an obscure passage from The Saga of the People of Laxardalr. Also anything involving Sam and her religion/culture. The correct usage of patronymics (including the hilarious "Thrym, son of Thrym, son of Thrym"), brief description about how Muslim prayer works, what it's called at what time, and how it can be postponed if you're in an urgency (a practice known as jama' ), even the Gratuitous Arabic phrases Sam sometimes mentions are used in the right situations (e.g. Inshallah when she vows that she'll marry Amir no matter what). In fact, most of Sam's scenes with Magnus, if not about battles or war strategies, are basically Riordan showing what he had researched about Muslim culture. Strong Family Resemblance: When he finally meets him, Magnus notes that Frey could never be mistaken for not his father. The Stinger: The epilogue showing that Magnus' Uncle Randolph was working for Loki and ends with the revelation that Thor's hammer is in Randolph's possession reads like a post-credits scene from a Marvel movie. Quite fitting, really. Stupid Evil: Ratatosk, Nidhogg, and the birds of Yggdrasill all play The Gadfly to each other despite knowing the anger it gives them can potentially cause The End of the World as We Know It, and that it would kill them too. The paradox ingredients in Fenris's new rope are Wi-Fi with no lag, a politician's sincerity, a printer that prints, healthy deep-fried food, and an interesting grammar lecture. A slight one to previous works: A 'rare child of Odin' is shown entering Valhalla after performing a great deed: and is promptly never mentioned again, a take that directed at Percy Jackson and Jason Grace, as well as fan expectations that Magnus would have a similar origin. "A pen sword. That is the stupidest thing I've ever heard." Magnus thinks "The Mead Thief" is a really bad name for a novel. Talking Animal: Most of them do talk. By the two-thirds of the book, Magnus stops being surprised. Talking the Monster to Death: How Magnus defeats Loki. Magnus challenges Loki to a flyting, a contest of insults wherein the participants trade barbs that literally break down their opponent. By channeling his bond with his friends and highlighting the fact that Loki is completely alone, unloved and untrusted, Magnus breaks Loki down into a form that's small enough to be imprisoned in the walnut Frigg gave Mallory. Talking Weapon: Sumarbrandr, after Magnus befriends him. Tangled Family Tree: Blitz assures Magnus that you'd need several flowcharts to keep track of Vanir and Aesir family tree(s). They Killed Kenny Again: Since the einherjar always revive after dying, as long as they died in hotel Valhalla, and every single thing they do there is to the death, there are too many examples to count. Took a Level in Badass: After Thor sends Hearth to Mimir, the elf gets a wizard staff which lets him do magic without exhausting himself like he used to. Took a Level in Jerkass: Loki, compared to Sword of Summer wherein he seems almost nice (until the end). In Hammer of Thor, he is much more mustache-twirly. Took a Level in Kindness: Sif originally seems very vain, but she really connects with Alex and proves to be very helpful to their plan. By the third book, it is just about confirmed that Magnus is bi/pan, given his attraction to Alex, regardless of her current gender. Samirah al-Abbas is a very devout Muslim girl, up to an incluiding being engaged for a Perfectly Arranged Marriage at 16, wearing a hijab all the time, enduring Ramadan fasts during a quest, and praying five times a day. Hearthstone is a deaf elf. Alex is a genderfluid/trans person. The third book also reveals that she's a Latina. Unusual Euphemism: Freya pays for dwarven jewelry with "a night of marriage". It means exactly what you think it does. Walking Spoiler: You might notice that Frey and Odin are subjects of most spoilered-out entries. We All Die Someday: Frey seems to have this view on the incoming Ragnarok, being completely fine with his own mortality. Weirdness Censor: The Mist is an ever prevalent force that keeps normal people from perceiving the supernatural. The series finally explains where the Mist comes from as well. As it turns out, the Mist is the result of the heat of Muspelheim mixing with frost from Niflheim in the Ginnungagap creating a vapor that flows into Midgard. Annabeth: It's time I introduced you to Percy. Who Wants to Live Forever? : According to Halfborn, some Einherjar do go crazy waiting for Ragnarok. Apparently you want to keep yourself busy. Averted at the end, where Magnus chooses to remain an einherjar rather than return to life on Midgard. Why Did It Have to Be Snakes? : Magnus is downright terrified of wolves, so of course everything in Valhalla is decorated with them, they're part of the staff, they prowl the woods in Jotunheim and the villain of the first book is Fenrir. Alex dies to them as well, and Utgard-loki makes it worse by dressing in a wolf helm for the majority of Hammer of Thor. World Tree: Naturally Yggdrasil plays a part in the series, as Magnuson and his friends have to traverse between worlds on it at one point. Its smallest branches are the size of redwoods and the largest of interstate highways. Its trunk is near incomprehensible in size to Magnus, and the crevices on the bark each show a different world as if someone wrapped bark around a column of glowing televisions. Wouldn't Hit a Girl: Not a person (as this is a World of Action Girls), but the sword Skofnung will hurt anyone who tries to draw it in the presence of a woman. You Can't Fight Fate: As in Riordan's previous series. While the events of Ragnarok are set and no one believes they can ultimately change the future, many gods and mortals choose to rebel against fate by delaying it and/or changing the details to achieve whatever small victory they can. Pretty much required as the Norse believed in absolute predestination as part of their cosmology, even more so than the Greeks. Your Size May Vary: The Giants. When Magnus meets the daughters of Geirrod they are 50 feet tall. However when he goes into the next room and meets their father he sees the ceilings are only 25 feet and Geirrod 20 feet, the giantesses should have been too large to get through the door. He wonders if giants change size as they walk between rooms.